Before we can dive in the integration of the Camping ABingo plugin with our prototype application, here is a quick overview of the basics of the ABingo framework. View or Controller Select an alternative for the current user based on the alternatives specified for this test. If no alternatives are specified a boolean value is returned. Tracks the execution using the conversion name if provided otherwise use the test name. Controller Tracks a conversion for the current user and the conversion specified. The test name is the fallback option. Note: these 2 main APIs are implemented in Camping in a helper module being included in both controllers and views. The ab_test is syntactic sugar over the test method provided by the core Abingo class. ABingo will need to track executions of your Experiments and their corresponding Alternatives in the database associated with your application. So the ABingo Camping plugin will include the needed migration to add 2 tables to your schema. We’ll see this in more details later. Note: You will find the fully functional test application under the examples/camping-abingo-test folder in the camping-abingo gem folder. If you want to start using it right away, skip the next sections and go straight to Setting Up Our First A/B Test. Otherwise follow along. In the next sections I will show you how to integrate ABingo with the skeleton test app. But before let’s get the skeleton application up and running. Locate the examples/camping-abingo-test folder under your camping-abingo gem folder. Open camping-abingo-test-skeleton.rb in an editor. You can now test the basic flow of the application. When viewing the landing page, the sign-up button should always be labeled “Sign-Up Now!”. Once ABingo is integrated we will be experimenting with different alternatives. 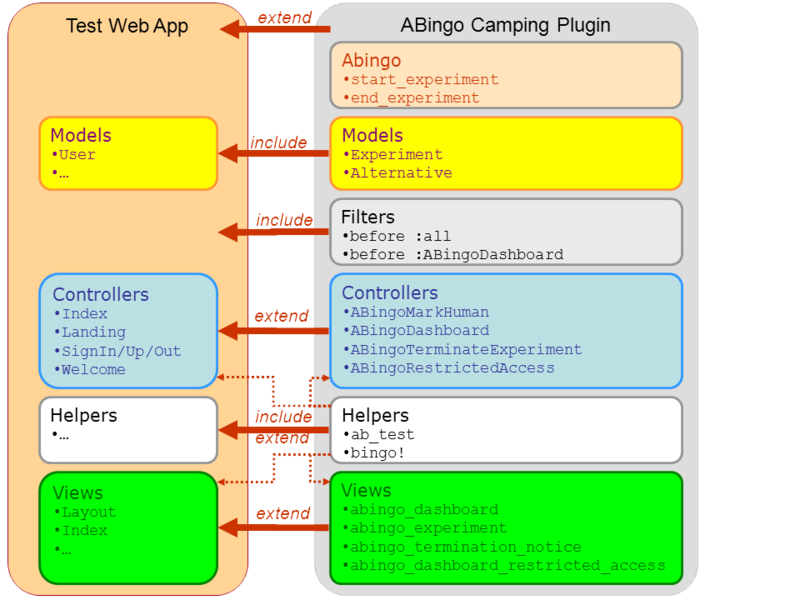 The ABingo plugin is composed of several modules mirroring the standard modules a typical Camping application would contain. We can also associate the logger with our camping-abingo plugin. Now let’s customize the create method by adding a call to ABingoCampingPlugin.create, so we can get the plugin to run any needed initialization. Ok, at this point we have a minimally configured application module. Now we’ll enhance the CreateUserSchema migration class to plug in our ABingo model migration. In the up method we will add a call to ABingoCampingPlugin::Models.up so that the Experience, Alternative tables can be created. In the down method we will add a call to ABingoCampingPlugin::Models.down to drop the ABingo tables. Set the identity to the new user’s id once signup is complete. @info = @user.errors.full_messages unless @user.errors.empty? Generate a new random identity when the current user has signed-out. Now our integration steps are complete. We're now ready to do some A/B testing! For our first experiment named call_to_action we'll vary the text for our signup_btn button by selecting one of 3 alternatives based on the user. So now we just need to record an actual conversion for the call_to_action test when the user clicks on the signup_btn button. At this stage, we have a basic Camping ABingo-enabled application, now let's test it! Note that the number of participants for the displayed alternative is 1. 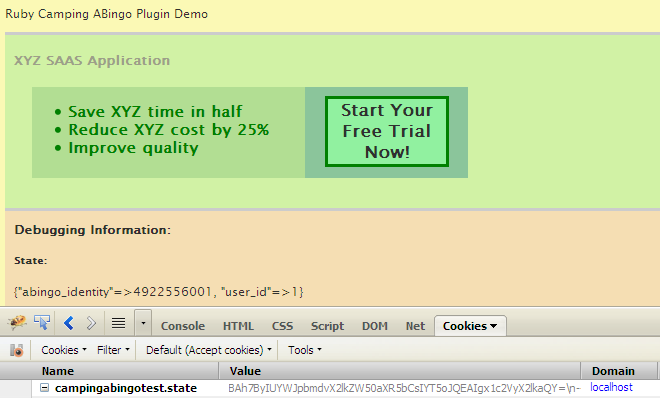 If you are using FireBug with FireCookie, delete the campingabingotest.state and refresh the page. You should notice that the abingo_identity should change as well as the button text. Repeat the process several times. And occasionally click on the button to cause a conversion to occur. Note that the number of participants and conversions have increased across alternatives. Checking the database for our results is quite tedious (even with Lita! ), luckily ABingo has a built-in Dashboard. Our Camping ABingo plugin has already defined a couple controllers and routes. We just need to expose the main /abingo/dashboard route. Now it is easy to see the results and even terminate a given alternative if we want to. Note: each experiment you have defined will be listed with its corresponding details. By default the ABingo Plugin initialize its cache based on a :memory_store. This is fine and easy to troubleshoot our simple test app. But for your application you should consider a more advanced caching mechanisms - see the ActiveSupport Cache documentation. One suggestion is to use Memcached if possible (e.g. on Heroku). Patrick McKenzie's ABingo is a powerful A/B testing framework for Ruby apps. ABingo makes it easy to define and execute experiments with multiple alternatives. The ABingo Dashboard makes interpreting test results a breeze! So hopefully this second post on ABingo (see here for the first post of the serie) will have given you a feel for how easy it is to A/B test-enable a Ruby Camping-based web application using the Camping ABingo plugin. Note: You can try the demo app yourself at: camping-abingo.heroku.com (including the ABingo Dashboard if you sign in as admin / camping). 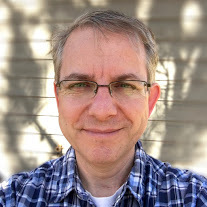 In a subsequent post I will cover some advanced topics (caching, troubleshooting, multi-variates, etc.) for Camping ABingo. Stay tuned!